Healthy Teeth Tips - Halloween candy: a trick or a treat? Kids and adults love candy! But their teeth don’t! Dr Tony Cassimatis from the Brisbane Smile Centre has some healthy teeth tips on Halloween treats. 1. Not all candy is the same. Actually inspect your child’s candy stash and remove certain types of candy. Chewy treats and hard candy are particularly damaging because they spend a prolonged amount of time stuck to teeth and are more difficult for teeth to break down. Sweets like chocolate that quickly dissolve in the moth and can be eaten easily lessen the amount of time sugar stays in contact with teeth. 2. Limit the amount of sugar. That what they eat affects their dental health. No matter when treat time is, it’s crucial to brush soon after. You want to reduce the amount of time sugar is in contact with teeth. If they cannot brush their teeth straight away at least get them to drink a glass of water or chew some sugar-free gum. Sugar-free gum containing the artificial sweetener xylitol is effective in combating the bacteria in plaque and fighting the acid that eats away at enamel. The chewing motion also stimulates the flow of saliva, which helps cleanse the teeth. Always keep brushing fun. Toothbrushes should be replaced every three or four months, so make Halloween an occasion for getting your child a new tooth brush. Children love to pick out their tooth brushes with their favourite cartoon characters and colourful designs. Your dentist can show your child the proper technique for brushing their teeth. These chewable tablets temporarily stain the plaque that builds up on teeth. 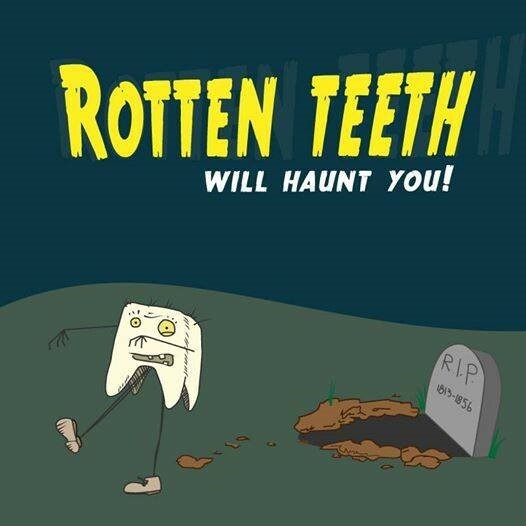 This will show children how well they are brushing and flossing their teeth. This will keep your child on their toes. 5. Teach your child to eat all foods in moderation. Although sweets are blamed for much tooth decay, all foods even so called healthy alternatives can promote tooth decay if eaten in excess. Children( like adults) should eat all foods in moderation. Always read nutrition labels and avoid foods and drinks loaded with sugar, fructose and other sweeteners.